"A traveler! I love this title. A traveler is to be reverenced as such. His profession is the best symbol of our life. Going from ___ toward ___; it is the history of every one of us." Read Nathaniel Hawthorne's remarks on Thoreau in Passages from the American Notebooks. Read one of James Russell Lowell's hypercritical essays on Thoreau, first published in 1865. Read Thomas Wentworth Higginson's essay on Thoreau in Short Studies of American Authors (Boston: 1888). 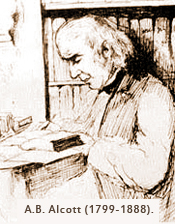 View caricatures of Transcendentalism in the Life and Letters of Christopher Cranch (1902). Clicking on images and hyperlinks throughout this site will bring you to source collections at museums, libraries, historical associations, schools, parks, cultural non-profits and other educational organizations and institutions. Hyperlinked quotes from primary texts are linked to source pages on the Internet Archive, Google Books, Hathi Trust, the Concord Free Public Library, and the Library of Congress, as well as other digital libraries of materials in the public domain. Many of the images of landscape paintings featured throughout the site come from museums and libraries, but some come from auction catalogs and sellers of reproductions. All of the images have been reformatted and reconfigured to display correctly in this context. If you click on an image that does not lead to its source, it means that the image was derived from pieces of other images in the public domain. 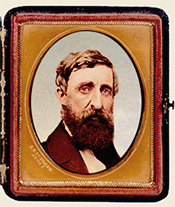 The Thoreau Society web site, newly developed during the spring of 2013, now features, among many other useful resources, a bibliography of works by and about Thoreau that are linked to full-text versions in the public domain. You can access this bibliography here. 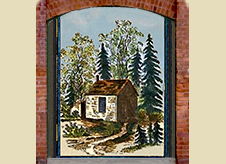 The Society has also made available on the Internet Archive various selections from its extensive collections, as well as back issues of its principal publications, The Concord Saunterer and the Thoreau Society Bulletin. Together, these two publications comprise the most comprehensive archive of Thoreau scholarship anywhere in the world, providing particular insight into Thoreau's rising reputation as a literary and political figure throughout the twentieth century. During 2014, the Thoreau Society plans to develop more detailed bibliographical lists and resources that will be placed online to provide greater access to the steady stream of Thoreau-related articles and books published each year. In the meantime, here is a list of some of the secondary sources consulted during the making of Mapping Thoreau Country. Please note that some of these sources, as well as many books and articles not included below, are hyperlinked to images and text in various pages, generally depending on whether they are freely accessible on the Internet, either in part or in full, in stable digital collections and databases. Janet Kemper Beck, Creating the John Brown Legend: Emerson, Thoreau, Douglass, Child and Higginson in Defense of the Raid on Harpers Ferry (Jefferson, North Carolina: McFarland, 2009). Raymond R. Boorst, The Thoreau Log: A Documentary Life of Henry David Thoreau (New York; G.K. Hall & Co., 1992). William E. Cain, editor, A Historical Guide to Henry David Thoreau (New York: Oxford University Press, 2000). John Aldrich Christie, Thoreau as World Traveler (New York and London: Columbia University Press and the American Geographical Society. 1965. Patrick Chura, Thoreau the Land Surveyor (Gainesville: University Press of Florida, 2010). Bradley P. Dean and Ronald Wesley Hoag, "Thoreau's Lectures before Walden: An Annotated Calendar," Studies in the American Renaissance,1995), pp. 127-228. Bradley P. Dean and Ronald Wesley Hoag, "Thoreau's Lectures after "Walden": An Annotated Calendar," Studies in the American Renaissance, (1996), pp. 241-362. Robert Gross, "Quiet War with the State: Henry David Thoreau and Civil Disobedience," Yale Review 91 (October 2005): 1-17. Philip F. Gura, American Transcendentalism (New York: Hill & Wang, 2007). Walter Harding, The Days of Henry Thoreau (New York: Alfred A. Knopf, 1970). Walter Harding, "Walden's Man of Science," VQR (Winter 1981). J. Parker Huber, Elevating Ourselves : Thoreau on Mountains (Boston: Houghton Mifflin, 1999). Lewis Hyde, "Prophetic Excursions," The Essays of Henry D. Thoreau, selected and edited by Lewis Hyde (New York: NorthPoint Press, 2002). Elise Lemire, Black Walden: Slavery and Its Aftermath in Concord, Massachusetts (Philadelphia: University of Pennsylvania Press, 2009). Milton Meltzer and Walter Harding, A Thoreau Profile (Concord, MA: The Thoreau Society, 1998). Sandra H. Petrulionis, editor, Thoreau in his Own Time: A Biographical Chronicle of His Life, Drawn from Recollections, Memoirs, and Interviews by Friends and Associates (Iowa City: Iowa University Press, 2012). Sandra Petrulionis, To Set This World Right: The Antislavery Movement in Thoreau’s Concord (Ithaca: Cornell University Press, 2006). Robert D. Richardson, Jr., Henry David Thoreau: A Life of the Mind (Berkeley: University of California Press, 1986). John Stauffer, The Black Hearts of Men: Radical Abolitionists and the Transformation of Race (Cambridge: Harvard University Press, 2004). John Stauffer, Giants: The Parallel Lives of Frederick Douglass and Abraham Lincoln (New York: Twelve, 2008). John Stauffer and Zoe Trodd, The Tribunal: Responses to John Brown and the Harpers Ferry Raid (Cambridge: Belknap Press, 2012). Robert F. Stowell and William L. Howarth, A Thoreau Gazetteer (Princeton: Princeton University Press, 1970). Jack Turner, editor, A Political Companion to Henry David Thoreau (The University Press of Kentucky, 2009). Laura Dassow Walls, The Passage to Cosmos: Alexander von Humboldt and the Shaping of America (Chicago: University of Chicago Press, 2009). Laura Dassow Walls, Seeing New Worlds: Henry David Thoreau and Nineteenth-Century Natural Science (Madison: University of Wisconsin Press, 1995). Leslie Perrin Wilson, In History's Embrace: Past and Present in Concord Massachusetts (Hollis, New Hampshire: Hollis Publishing: 2007). Robert M. Young, Walking to Wachusett : A Re-Enactment of Henry David Thoreau's "A Walk to Wachusett, " (Leominster: LuLu.com, 2008). 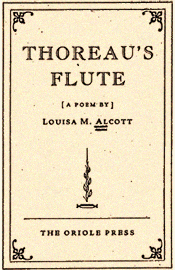 Read "Thoreau's Flute," a poem by Louisa May Alcott, originally published in the Atlantic Monthly (September 1863). Read a reprint of "The Forester," Bronson Alcott's tribute to Thoreau, originally published in the Atlantic Monthly (April 1862). 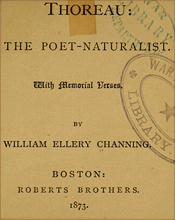 Read Thoreau: the Poet-Naturalist, published by his close friend Ellery Channing in 1873. 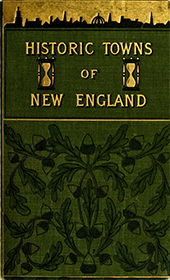 Read Historic Towns of New England, including a chapter on Concord by Franklin Sanborn (1898).